February has been a camellia-filled month so far with the garden starting to bloom and pink camellia flowers everywhere. As the buds pop open, I find myself bringing them inside to admire while planning new ways to style and display them. One afternoon as I was outside clipping camellia blooms my mail arrived. There I saw the new issue of Garden Design magazine, a subscription I always love to receive. So of course I immediately took a break, made myself a cup of tea, and opened the pages only to discover this fascinating article on- you guessed it- camellias! The opening words said it all. "Camellias have captivated gardeners for centuries but new forms and cold-hardy versions have added pizazz to this beloved genus. Prepare to dream and ponder as you revel in over twelve pages of Ngoc Minh Ngo's astounding photography." 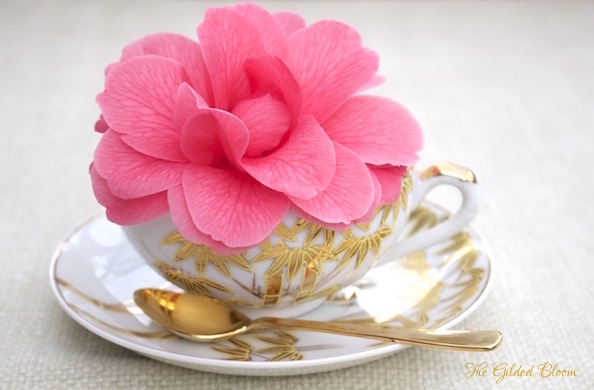 According to the article, the camellia was considered sacred in ancient Japanese culture, so I chose an antique Japanese teacup to hold this bright pink bloom. 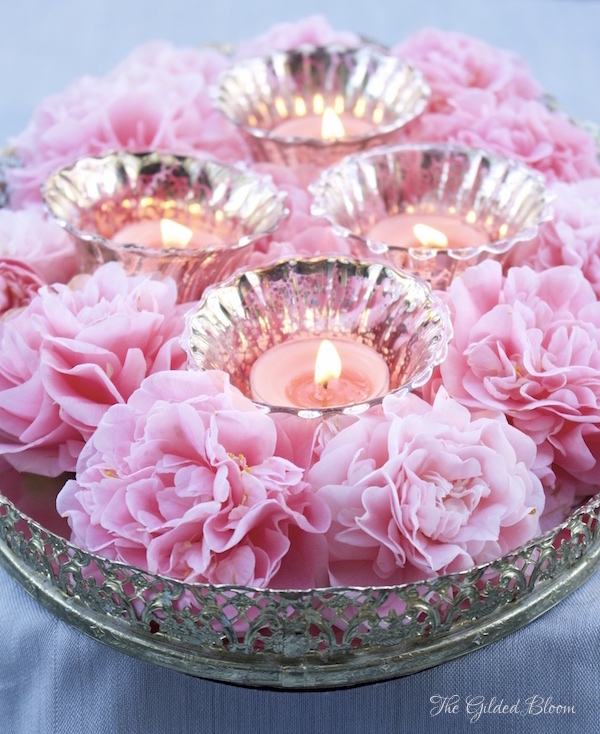 Then I designed a tray of Debutante camellias in a bit of water around a set of lit votives for an elegant candlelight display. Next I used this vintage glassware, recently given to me by a dear friend, and created these fanciful vases to scatter across the table for an upcoming brunch. 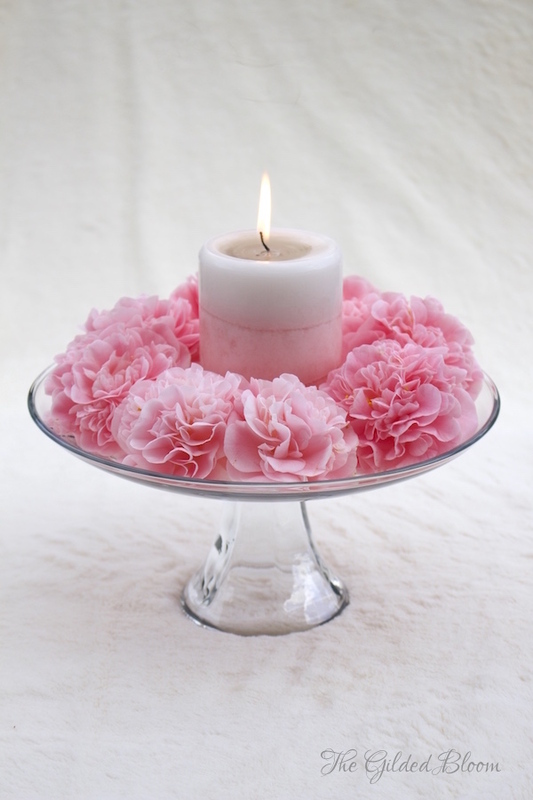 Then I designed a ruffled ring of multilayered camellia flowers to encircle the new Pink Champagne candle I bought for Valentine's Day. Again I kept the flowers moist with water at the base. The fragrance was beautiful and the candle more glamorous surrounded with blooms! 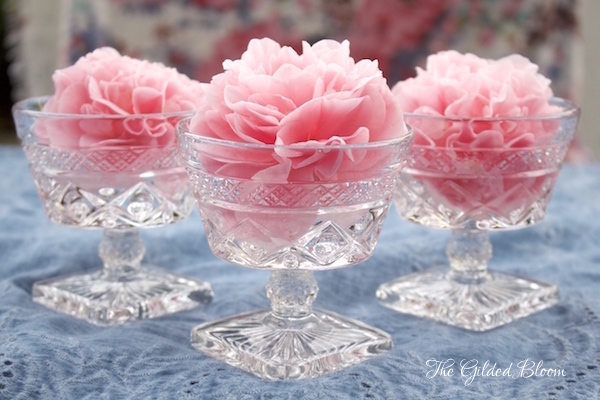 I hope you'll try some of these simple ideas to enjoy your camellias. Styling them was such fun! Lisa, your images are stunning! 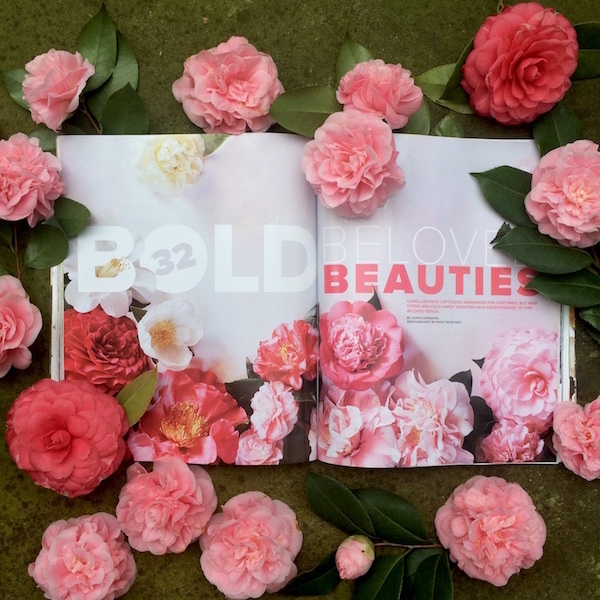 Each one is so beautiful, the camellias are truly exceptional. Belated thanks, Lidy. I just found this comment in a hidden folder on Blogger. So sorry to have missed it earlier. This new interface has a few surprises!